Beau has a home! - Rocky Mountain Great Dane Rescue, Inc. Beau has a home with his new family in Salt Lake City, UT! Beau will be Kara & Liz’s 2nd Great Dane, and 2nd time adopting from RMGDRI! They adopted sweet Rose back in 2011 at age 6.5, and she had a life of love until recently passing this past November at age 12. A few days before losing Rose, they lost their beloved Lab, Joey, and their hearts were broken. 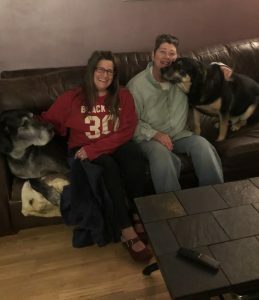 They knew the hole could not be filled with just any dog, so when they saw that Beau, a sweet senior at age 9, needed a foster home, they stepped right up to help! They fell in love with his sweet nature, and old gent ways, and knew he was home to stay. Beau will share his home with many new animal siblings; Thor, who is an older gentleman pup like himself, 4 cats (Pinky, Howl, Ramona, and Ms. Kitty), Reggie the Turtle, and two ducks, Billie and Frances. Kara & Liz are happy to provide this sweet senior , and all their pets, with never ending love, and affection! Way to go sweet Beau!